Well, it has been a challenging few days. Big Girl’s surgery was Tuesday morning. I was awake at 3 that morning, thinking about what all we had ahead of us. We were off to the hospital around 7:30 and got her checked in and into pre-op. And then we waited and waited for things to get started. Some of our sweet friends came by to sit with us and keep us company. 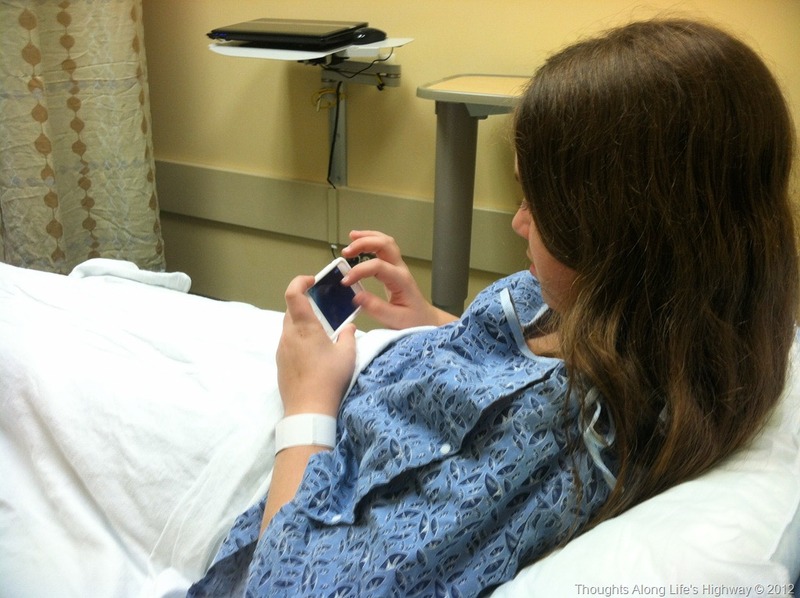 It was so nice of them and much appreciated – I think Big Girl loved the distractions as she got pretty nervous the closer the surgery time approached. 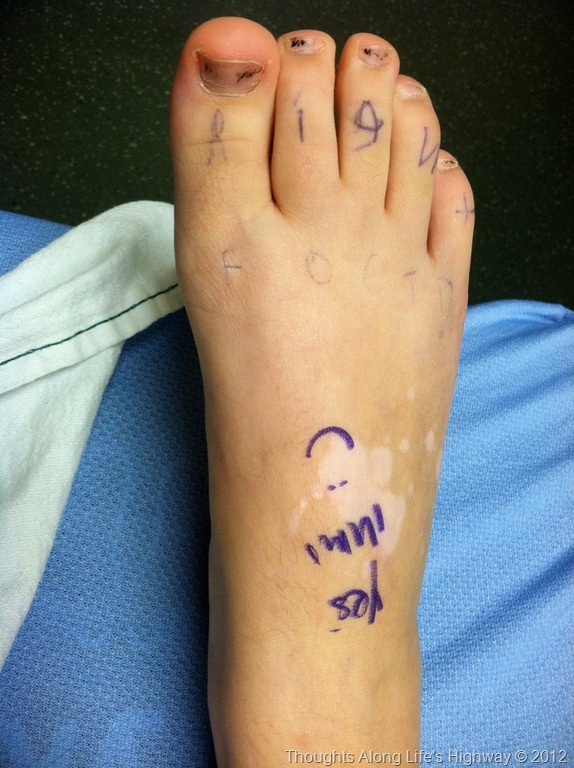 The surgeon came in and talked with her and marked her foot for surgery. He thought it was cute that she’d decided to mark it herself the night before. Then the anesthesiologist brought some “happy medicine” and the whole process began. 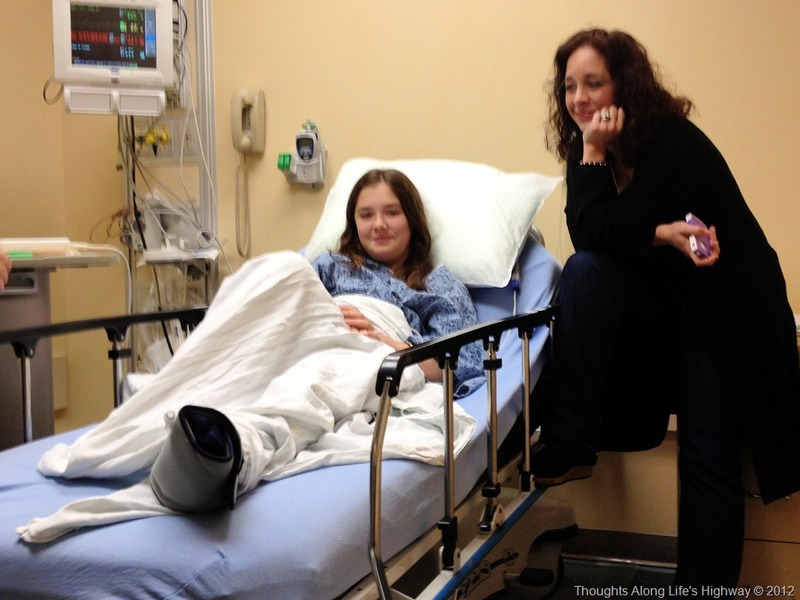 While she was wheeled away, I watched her go with a huge lump in my throat. It’s so hard to turn your baby over to someone else to care for her, even if you know they are the exact right people at the moment and will do exactly what she needs. We wandered down to the waiting room and I tried to crochet to pass the time, but I couldn’t focus. So, we just visited, Mom and SuperMan and our friends and I. I was so thankful they were all there. I remember sitting in that same waiting room a few months ago when SuperMan had some minor surgery and I was all alone and so very worried about my sweetheart. It never gets easier, no matter how minor the procedure, because my love is never smaller. Once we had the news that she was out of recovery, we met her in her room and waited until we had the ok to take her home. I fully expected her to sleep most of the day, but true to her “I do it myself” way, she was perky and up most of the afternoon. Each day has been a little better than the last. Nights are tougher, but even those are getting better. 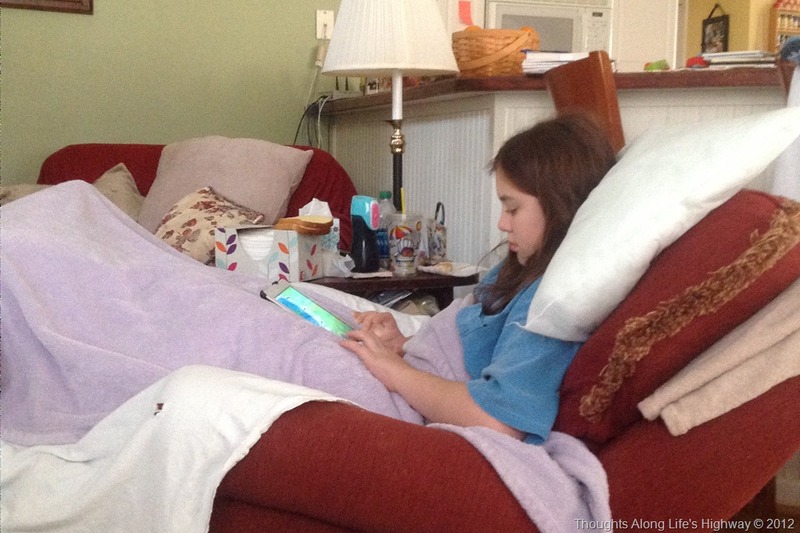 She has “command central” in the sunroom on the sofa bed – the perfect sunny place to hold court while she heals. And now we just focus on each day getting stronger and better and hopefully soon she’ll be walking again. We have a long haul, but she is a tough little girl. If anyone can do it, she certainly can. 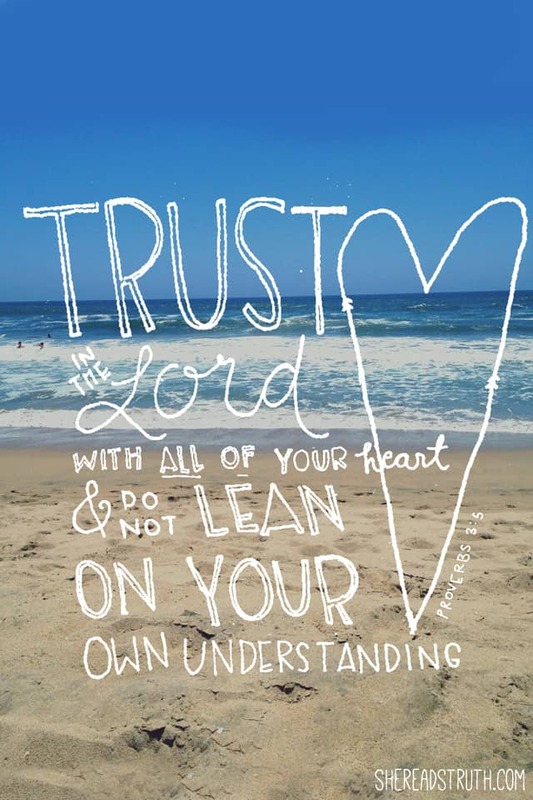 I’m hoping to post periodically, but it probably won’t be every day – I am hoping we get to a new “normal” here soon and blogging will fit right back into my routine. I appreciate your patience until it does. Awe…. Looks like y’all are managing pretty good. I know with a loving and attentive momma like you she’ll be 100% in no time! She is handling things so well… I am very proud of her. And, yes, being a momma is hard, but the payoff is so worth it!